Counterpath is the leading provider of desktop VoIP software solutions, known for their VoIP products like the X-lite, Eyebeam, and the newer Bria. We are particularly fans of Counterpath’s Eyebeam; at less than 50 dollars a pop, it’s an inexpensive enterprise-class softphone that works great on our laptops and desktops (headset recommended for the best experience). I expected they would be one of the first companies to release a mobile VoIP softphone for the iPhone OS. For a company that already makes softphones, how difficult can it be to make a similar product on a different platform, right? Needless to say, I was disappointed a few months back when I searched the App Store for ‘Counterpath’ and found nothing. 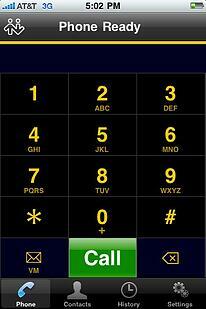 Counterpath recently announced the release of an iPhone edition of their Bria Softphone. This is an ‘Enterprise-Class and Carrier-Grade VoIP Softphone’, meaning that it is designed with the business user in mind. This kind of application is exactly what we have been waiting for. 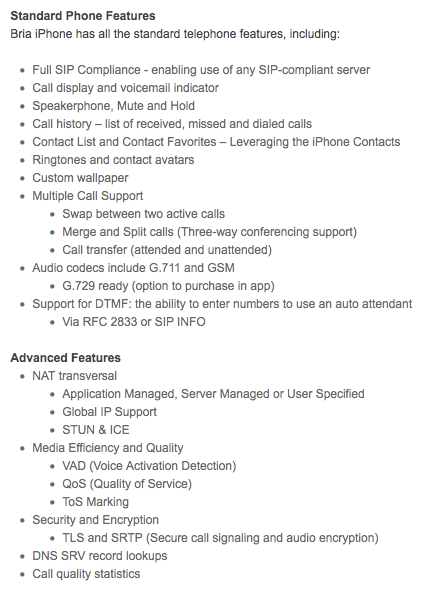 Bria iPhone edition has a lot of competition in the mobile VoIP app market. There are probably no less than a dozen similar apps, each of them months ahead in terms of the number of updates and upgrades. The good news is that Counterpath included pretty much everything we wanted in their first version. While other publishers started their apps with the very basics (making and receiving calls) and added additional features slowly over the weeks and months, Counterpath crammed almost everything we could possibly want in their first version. This product is aimed at not only consumers, but also ‘enterprises, and government agencies’, and it certainly shows. Here is a full list of the features offered, taken directly from the page on the Counterpath site. The application itself looks and feels great. Particularly cool is the way that call handling options and call information slide onto/off the screen when you enter/leave a call. It does a good job of mimicking the iPhone’s native calling experience. Configuring Bria for iPhone is very quick and easy. Click here to see a walk-through of the configuration process for OnSIP accounts. Counterpath wants you to think of the Bria iPhone edition as the mobile version of your deskphone, which means I can be as frustrated and angry as I want to be if something doesn’t work. On that note, I’m happy to report that for the most part, all the advertised features worked extremely well. I never had to go to Charlotte (our Network engineer) and ask, “What the heck just happened”, which is always a plus for any phone/ user agent we’re testing. 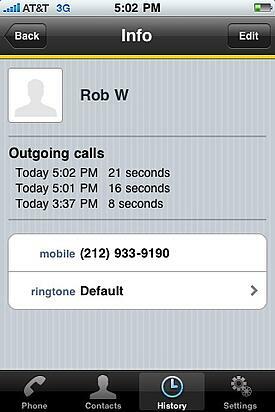 There were a few times after I reached an extension from an auto attendant when the softphone would display the dialing menu instead of the call handling options. There is a small ‘back to the call’ button on the dialing menu, which they mean to take the user back to the call handling options, but it can sometimes be completely unresponsive. There were a few tests that couldn’t be done simply because the Bria Softphone edition only allows you to have one account registered at a time. It also does not allow you to save other accounts, which can be a bit annoying if you have multiple accounts or use several VoIP providers. Noticeably absent are push notifications, which means that realistically, users will probably only use the iPhone Bria to make outbound calls, at least in the near future. It will be interesting to see what new functionality will be introduced with iOS 4. The current version of the iPhone Bria supports G.711, and GSM codecs as cell audio codecs. G.729 can be purchased for an additional $8.99 as an add-on. G.722-HD is available but only on Wifi right now. The overall sound quality is pretty good—a little better than what you get on a regular cellular call when you're using a narrowband codec and much better with G.722 on Wifi. We also did not experience a noticeable degradation in sound quality when switching from WiFi to 3G while using G.711. Naturally, your call experience over 3G will vary depending on the network connectivity strength at your location. The iPhone Bria includes four main screens: the standard dialing screen, iPhone contacts, call history, and settings. 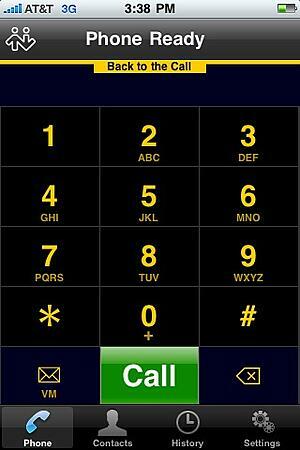 The dialing screen is not very different from any other dialing screen. The status of the application is clearly displayed at the top of the screen, and users can either use the numpad or type in SIP addresses. 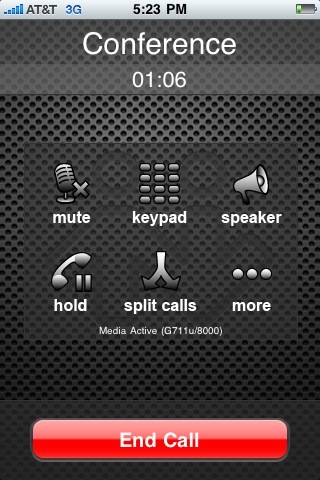 There is also a voicemail button conveniently placed towards the bottom of the screen. 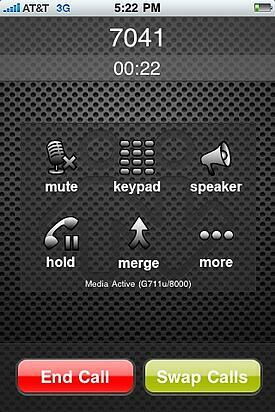 Mid-call, users get a call handling menu that is very similar to the iPhone default. Features like mute, speakerphone, return to the keypad, hold, and add a second call are all there. Clicking on the ‘more’ button will allow you conduct a blind (unattended) transfer. When there are two simultaneous calls taking place, the ‘add call’ option turns into ‘merge’ which allows you to conduct a 3-way conference (The option to split a conference into two calls appears). 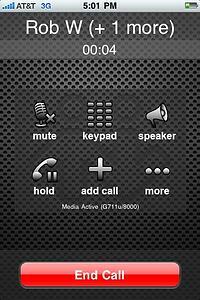 Users also get an added ‘swap calls’ button that seamlessly switches between the two calls. 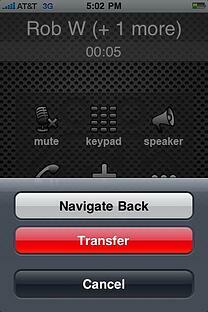 Clicking on the ‘more’ button when there are two calls taking place will allow an attended transfer. The ‘contacts’ screen is the iPhone directory with a different colored background. 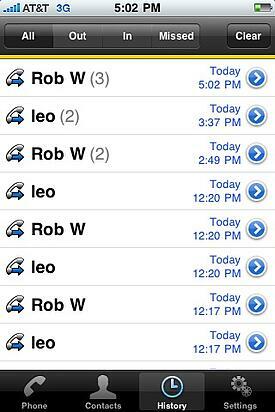 The ‘call history’ screen is also very similar to the iPhone default. It even behaves the same, except that it will ask you to confirm that you want to make a call when you click on a listing. In ‘settings’ > ‘user preferences’, you can set your ringtone, and change your active call background. ‘Advanced settings’ allows you to access the application logs and gives you the option to encrypt audio. The Bria for iPhone is probably one of the first mobile VoIP SIP Clients designed specifically with the business user in mind. The advertised features all worked very well in our tests, and I will certainly be looking forward to the upcoming upgrades that are planned for this application. It is very exciting to see Counterpath entering the mobile VoIP market with a strong first showing, and it looks like they are only getting started. In an interview with Alec Saunders, Counterpath VP Todd Carothers revealed that an Android version and iPad support (XMPP, contact lists, and rosters) are just around the corner. 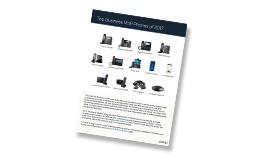 Our phone review team has compiled a list of our Top Business VoIP Phones for 2017. To see which brands and models we consider the best value, simply fill out a short form through the button below.